The third year they leap." 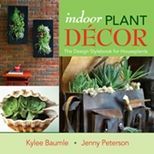 ...and some of it is due to the diversity that has occurred because of my ongoing obsession with all kinds of different plants. One of the reasons that a plant might not due well is because of insect predators. 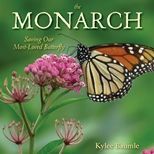 Certain plants just attract certain bothersome insects. Japanese Beetles love roses. Black aphids love nasturtiums. Gold bugs love anything in the Ipomoea family. Slugs love hostas (and other things). 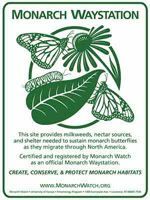 We are an organic garden 98% of the time, because we are a registered Monarch Waystation, and because we have a distaste for pesticide use in general. 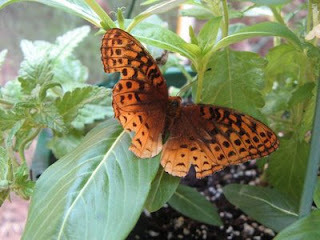 We never use pesticides on any plant that we know the Monarchs and other butterflies or bees like to feed on. Last year, we only used Safer's Soap once on the green beans because the leaves were being eaten voraciously by some sort of pest. This was really the only insect problem we had all year. This year, in addition to the Japanese Beetles which are manageable by hand-picking them, we've had cabbage worms. Neem Oil took care of those. I've seen a few earwigs, but not as many as we've had in the past. It seems that each season, we have less and less of a problem with harmful pests. It's my opinion that this is due to the great variety of plants that are grown in our gardens. 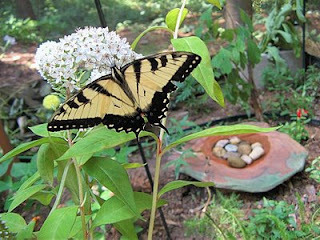 By growing so many different things, we attract a large variety of insects. Many of them are natural enemies of each other, so they keep each other in check. Most beneficial insects are in the larval stages of development when they eat their prey. Most adults feed on nectar. So generally it's the flowers that attract the beneficial insects. A month or so ago, I saw something that showed me that the birds play a part in this natural co-existence, too. As I was working in the garden, I noticed our resident Baltimore Oriole picking at the Lonicera 'Dropmore Scarlet.' Just a few days before, I'd noticed the blooms were clustered with grayish-black aphids, similar to the ones we've seen on nasturtiums. Oriole food! Orioles forage in the garden, looking for several different insects to eat, as do finches, robins and sparrows. Rarely has a pest done major damage to any of our plants and I believe it's because of the diversity of plants growing here. Mother Nature does have a way of taking care of things. And this is a really good excuse for me to continue diversifying. Yeah, that's it. I need more plants to help control garden pests. I like growing "different" things, so when I saw these little round carrots on the seed rack this spring, I knew I had to grow them. This week, I noticed some of them popping up out of the ground, so I pulled a few. Now I don't like raw carrots and I haven't yet had a chance to cook any, so I can't tell you if I think they taste good or not. But Romie and Jenna both tried them and proclaimed, "They taste like carrots," so there you have it. It's a very well-known fact around here that Jenna hates cooked carrots, so of course, I fix them as often as possible when I know she's going to be home. She's not influenced in the least by the fact that cooked carrots are better for you than raw ones. She just doesn't like them. Just like I don't like raw ones. 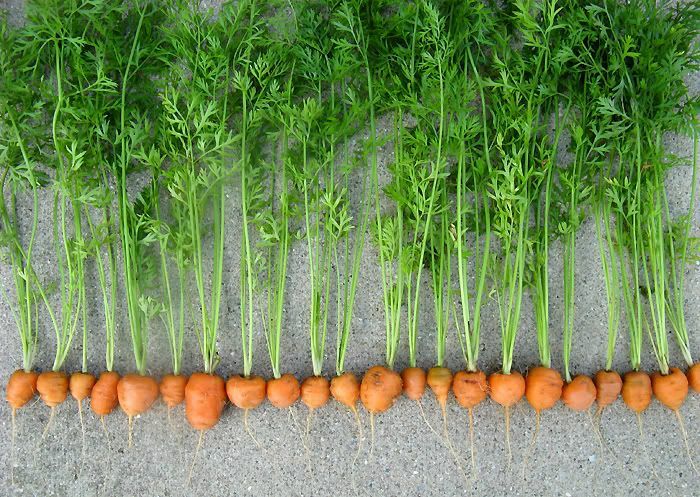 We're growing 'Bolero' Nantes carrots, too. I wonder if any of those are ready yet. Summer continues on at warp speed, as usual, and I think we're done with the spring chores now. Seriously. I don't know why I even label them "Spring Chores" because spring is well on its way before we can even begin them and it's but a misty memory by the time they're done. But that's just the way it is in the garden. 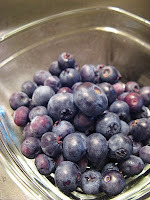 So we're enjoying the fruits and vegetables of our labors, having stripped the strawberry bed of every last bit of its yummy goodness (we just finished eating the jam, too), eaten the minimal spinach harvest (need more sun next time), gathered enough blueberries to top a couple of bowls of cereal, eaten enough beans to last us until next year (but they're still coming on), pickled several quarts of beets (m-m-m...beets! ), and pulled the first of the cute round carrots and the garlic. 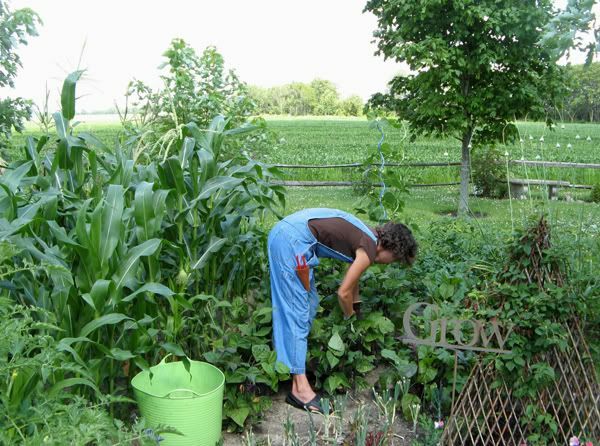 Still to come: sweet corn, okra, Brussels sprouts, Bolero carrots, onions and tomatoes. Goodness, the tomato plants look like they're on steroids. The roses are the current source of my discontent. None of them are dying, there's no black spot or powdery mildew, and the aphids haven't yet made an appearance. There's minimal evidence of Japanese Beetle action, and of the 74 Japanese Beetles caught (and 31 that got away), just one was found on a rose. So why am I disappointed in the roses? They aren't blooming much, and it's my fault. I know they need at least six hours of direct sunlight to perform well and many of them just don't get it. It was wishful thinking on my part when I planted them in part shade that there would be enough sun, but they're pouting - telling me I was wrong. Now I've got a problem. Where do I put them so they'll be happy and do what they're born to do? I could make a new bed just for the roses, but Romie won't be happy about tearing up more grass. He isn't a big rose fan in the first place. Now if I wanted to make a new bed and plant Black-eyed Susans, that would be a different story, but that isn't going to happen. We've got enough of those already. And I never really wanted a rose garden anyway. I could make room in some of the other gardens for them, but that means I'd have to move something else. Max's Garden, where I'd need to put them, has the ratio of sun to shade shifting more to the shady side all the time, so that limits my possibilities there. Then I worry about the actual moving of said roses. Some of them are quite large and established, although still movable, I think. But when is the best time to do that? Fall? Spring, before they start growing again? 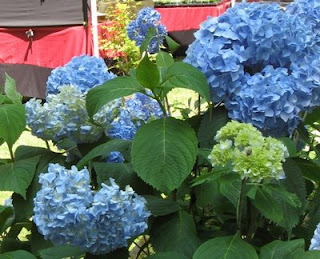 Even though they've now got diminished bloomage, some blooms are better than no blooms due to dead plants. 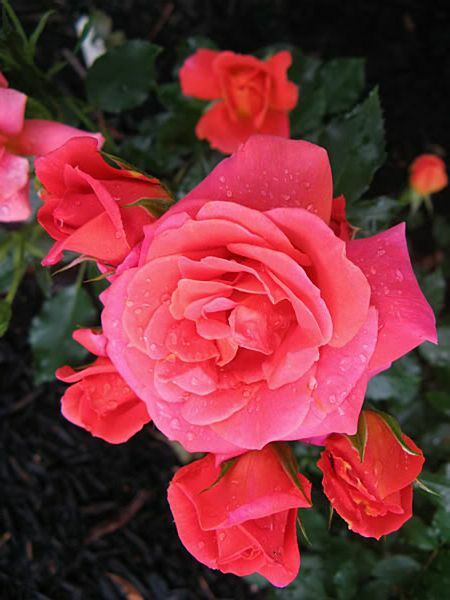 So I'll ponder my dilemma and in the meantime, the roses will continue pouting and withholding the best of what they have to give until I give them what they need. I thought I was doing well this year by remembering to fertilize them. 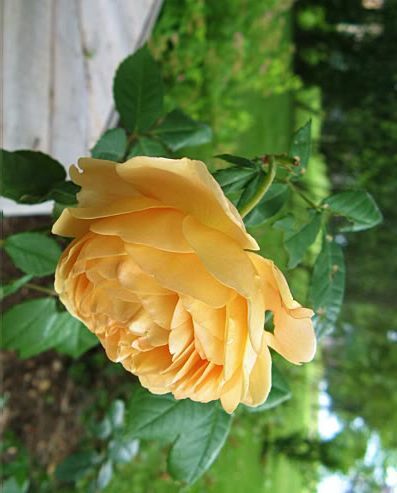 One of these days I'll get my rose act together and I can move on to correct some other mistake I've made. For as disappointed as I am about the roses, it's still part of what makes gardening appealing to me. 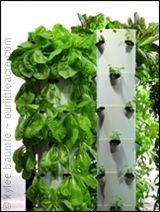 The challenges and the learning processes that are continually a part of growing green things stimulates my senses in ways that nothing else can. The rewards of "getting it right" make each and every trial and error worth it. 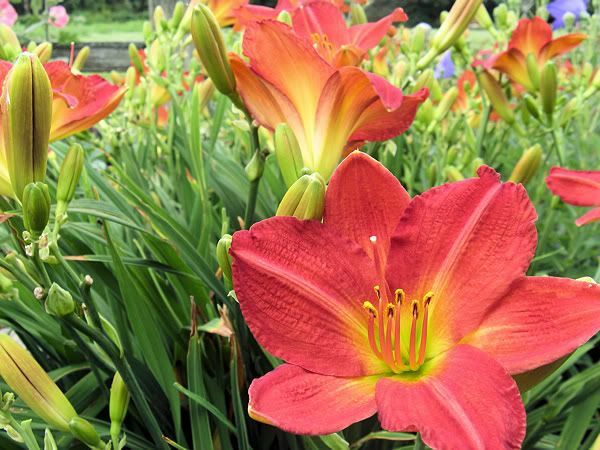 We have our own little lilyfest going on right here at Our Little Acre. 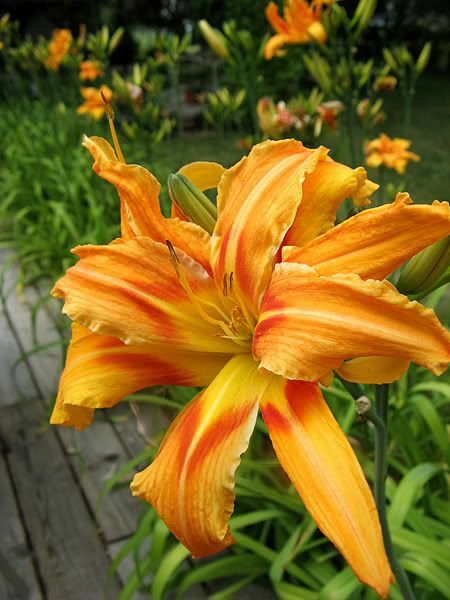 We're enjoying the frilly blooms scattered throughout Max's Garden, where nearly all our daylilies are located. 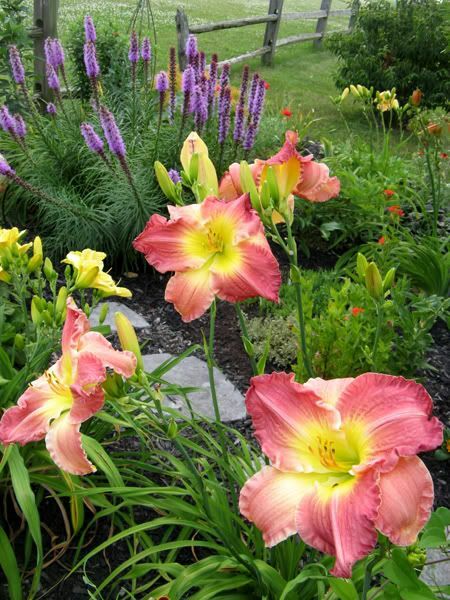 We don't have regular daylily gardens like you see when you visit a hemhead* garden, where they are generally placed in daylily beds or grouped in large clumps. 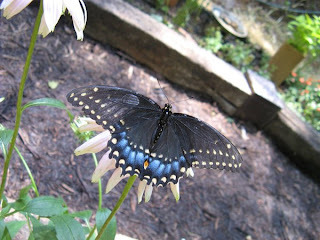 Ours are here and there, living happily among the other perennials, annuals, herbs and roses. 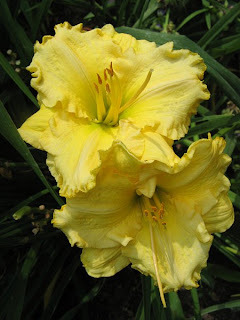 However, the more daylilies we get, the closer they get to each other. Some have been here for a very long time, and those have spread to the point that I'm feeling like some need to be divided. 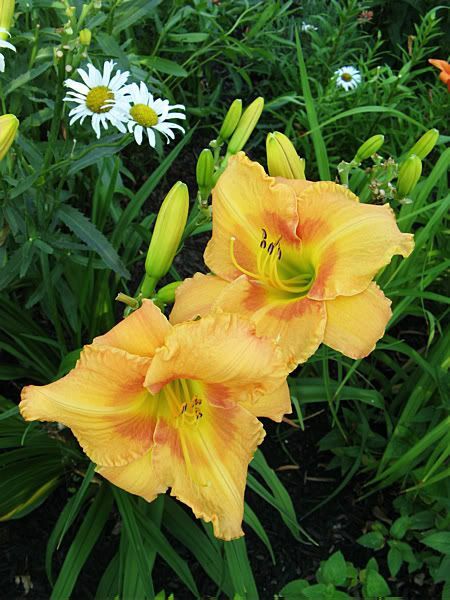 The nice thing about older, larger clumps of an assortment of daylilies is that you're pretty much assured that once they start blooming, successive blooms keep them going for a month or three. 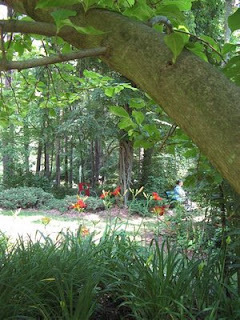 When we moved here in 1977, there was minimal landscaping on the property with very few flowering plants. 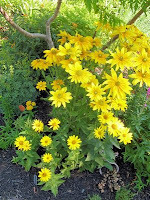 I can remember a couple of peonies, yellow potentilla, and some orange daylilies. 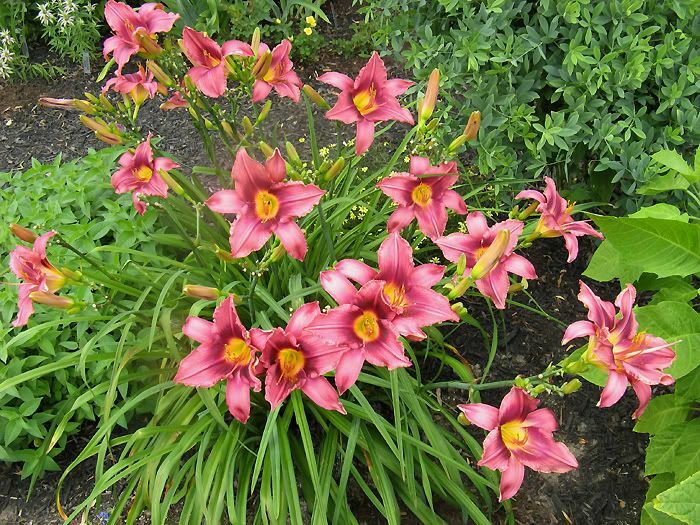 Those original daylilies still grow here and have multiplied exponentially. They line the north side of our pool area, and we've shared them with neighbors and family. 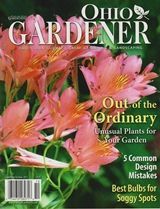 I used to think they were run-of-the-mill ditch lilies, but last summer, I took a good look at them, and they certainly are anything but ordinary. The color is familiar, but the form is double and sometimes triple! (Could be 'Kwanzo'?) 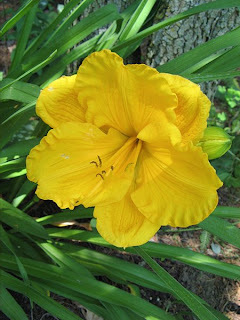 I have a new appreciation for these daylilies that we've been enjoying all these years. I thought 'South Seas' was a great, vibrant color, but wow! This one is so reddish-orange that it's hard to capture the gorgeous color. 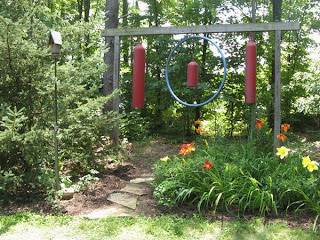 It definitely catches your eye in the garden. 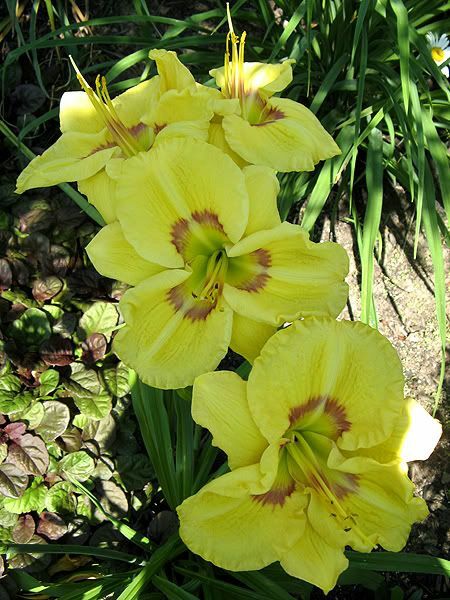 Another Great Garden Plants selection - and a rebloomer. I originally thought this was 'Strawberry Candy', but now I don't think it is - no dark edges on it. This was a passalong that I got so long ago I don't even remember who gave it to me. I do have 'Strawberry Candy', but it's not blooming yet. 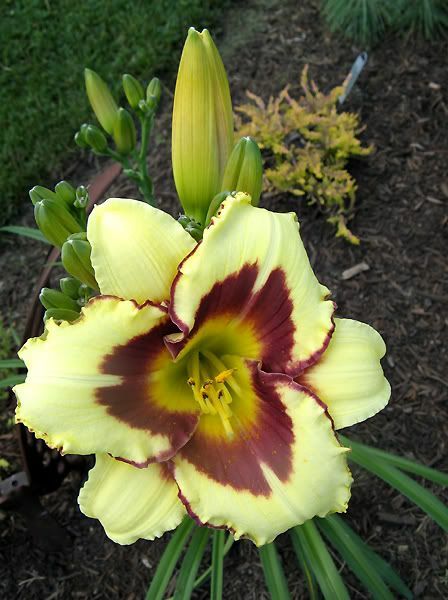 This is a hybrid from daylily hybridizer Lana Wolfe. Mom and I visited her nearby gardens last summer and I purchased this unnamed and unregistered hybrid from her. She "done good" on this one! 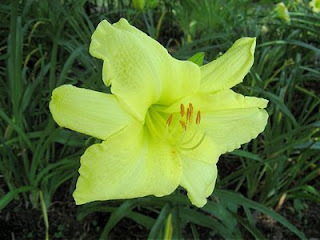 This spider daylily is large and the greenish centers glow when they're illuminated by the sun. An unnamed hybrid by another hybridizer - Barbara Wolff - which she simply calls 'Wolff 734'. I bought this from her two years ago, so I need to call her to find out if she ever named and registered it. It's quite large. Another great one from Barb Wolff. The eye is a little more subtle than this photograph suggests. 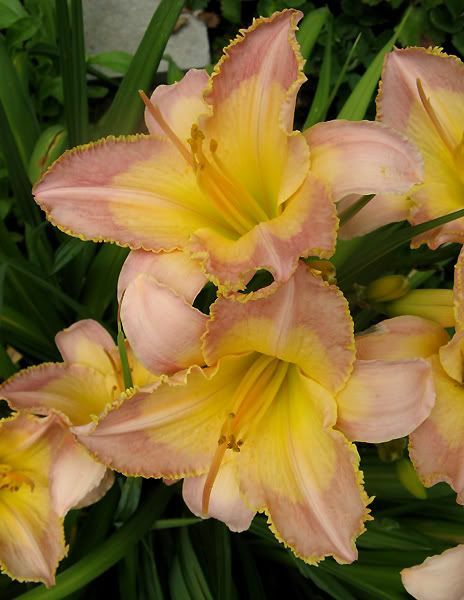 Another Lana Wolfe hybrid that I called 'Lovely Lana'. 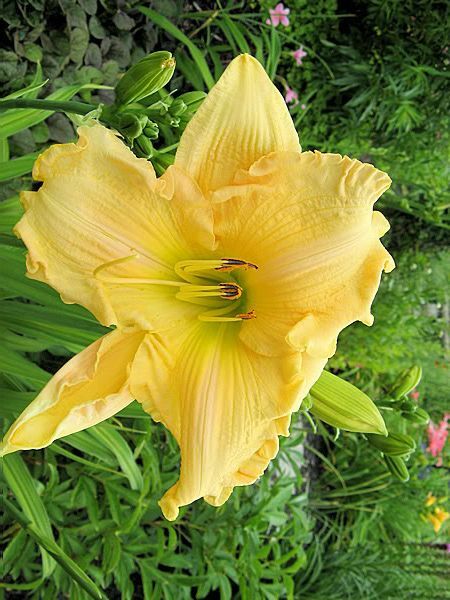 Of course, it will never be named that because there's already a daylily by that name and this isn't it. This one is another of hers that isn't named or registered. But she should. It's GINORMOUS and a heavy bloomer. Stunning. Such a pretty thing. Creamy coloring. Just sweet and perfectly named. Its blooms are small, but goodness, it's prolific! And fragrant! 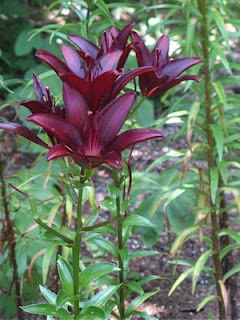 No ID - I can't remember where I got these (from Mom probably), but they were the first daylilies planted in Max's Garden in the fall of 2005. They've really spread and I should divide them and share the love. They're a deeper red than this photograph shows. Very similar to 'Pardon Me'. 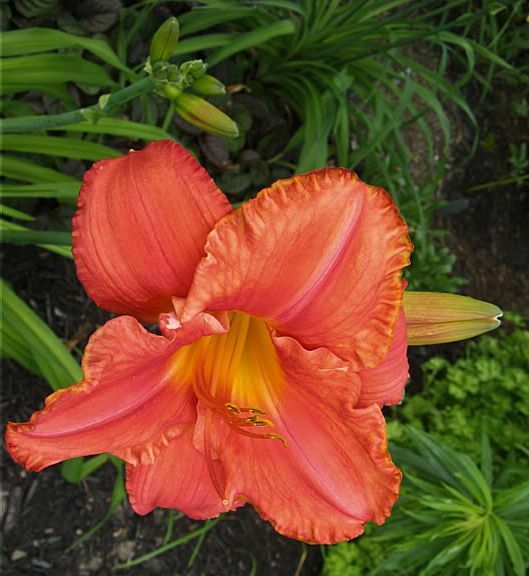 This is a really luscious shade of deep corally orange. 'Stella d'Oro' is taking a break. * "What is a hemhead?" you might ask. 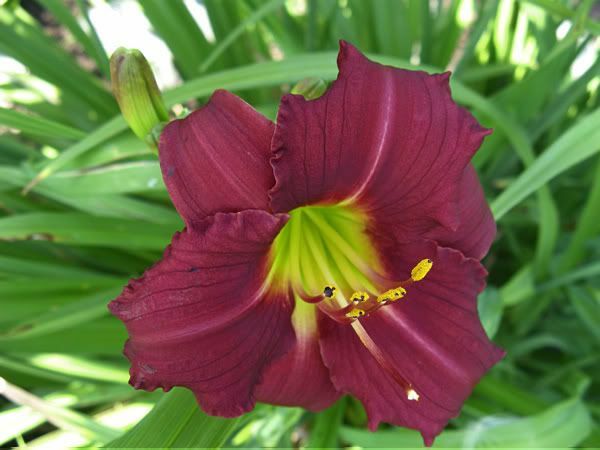 The genus name for daylilies is Hemerocallis, so just as Jimmy Buffet fans are called parrotheads, daylily lovers are called hemheads. I'm not one. Yet. 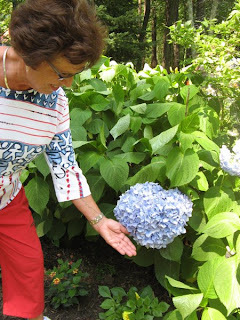 Two weeks ago, Romie and I, along with my mom and dad, took off for the southeastern part of our state - a mere three hours away - to attend LilyFest near Logan, Ohio. 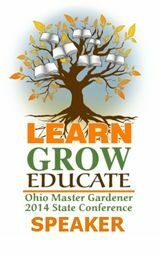 I'd heard about it through Ohio Magazine (what a great resource for events and history in our great state!). 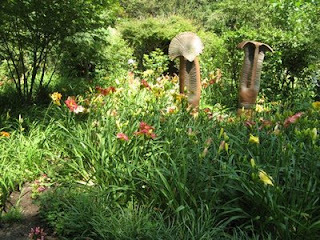 LilyFest is a yearly event, first held in 1992, at the home of Bobbi Bishop. 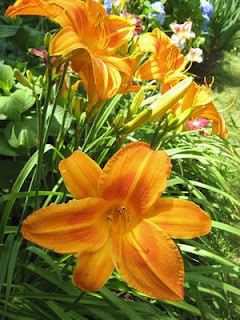 Bobbi and her husband Bruce (who has passed away) created beautiful gardens on their home property, featuring daylilies. The festival has grown since it was held that first year until it entertained around 8000 visitors in 2007. We arrived around 1:00 p.m. and festivities were in full swing. 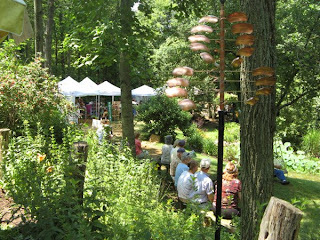 There was live music and many artists and vendors set up around the grounds, as well as a butterfly habitat. The gardens are pretty spread out, so there's room for all the extras involved with a festival. 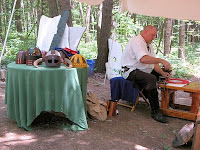 We walked through a Viking settlement in the woods on the way to the actual lily gardens. That was interesting, although I'm not sure why that was going on in conjunction with LilyFest. We spent about two hours there, strolling through the gardens, which also contained various types of permanent sculptures. Mom bought a couple of Himalayan clematis, and while I wanted to purchase a lily in commemoration of our visit, I left without doing so. 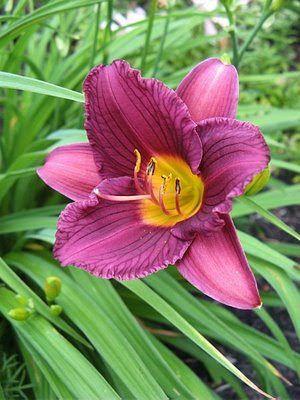 I probably would have bought the daylily 'Victoria's Secret' since it is the number one bestseller there, according to the vendor. 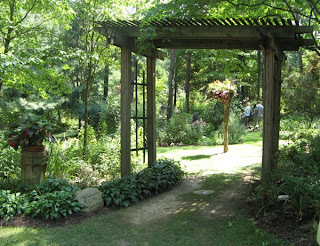 I don't know that I would drive three hours just to attend LilyFest again, but it's in the Hocking Hills and that's reason enough to plan a trip around the festival. You won't find much more beauty in our state than here, and it's one of my very favorite places in the whole wide world. More on that to come! 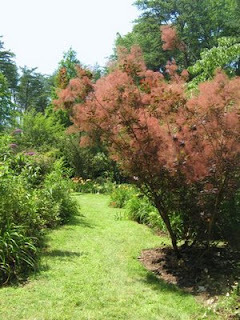 This was a beautiful Smoke Tree (Cotinus coggygria). Does anyone know what this shrub is? 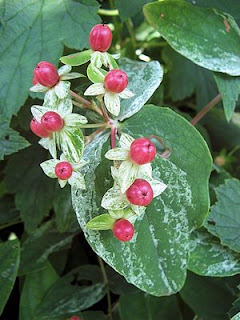 I have a Variegated Japanese Knotweed that has similar-looking leaves, but I don't remember seeing any berries at any time. UPDATE: This is a variegated St. John's Wort, probably Hypericum androsaemum 'Glacier'. The people sitting are listening to and watching live musicians. 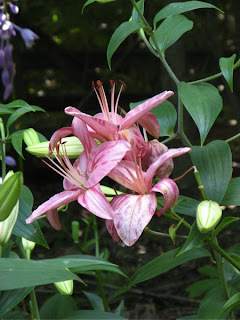 The woodland setting provided a gorgeous backdrop for the lilies. 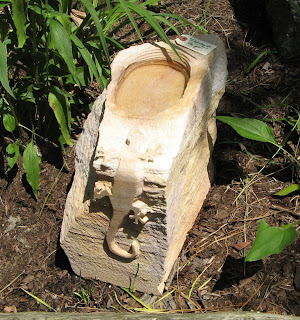 One of the vendors did sandstone carvings. I especially liked this water feature with the lizard crawling up the side. 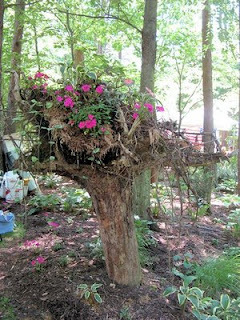 Have a dead tree? Cut it off, turn it upside down, and plant it! 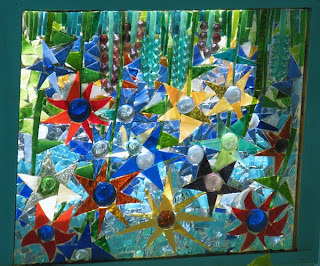 One of the beautiful stained glass art pieces. 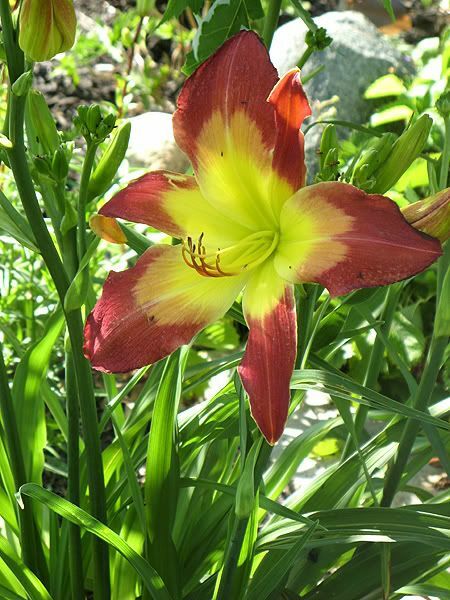 I loved this 'painted' lily and would love to know its name. None of the lilies were labeled, unfortunately. Does anyone recognize this? What a gorgeous caterpillar in the butterfly habitat. I'm not sure what this will later become. I like the rounded petals on this one. There were a couple of pottery vendors. 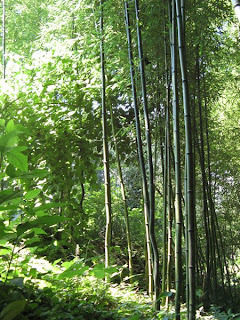 There was a nice stand of bamboo growing. Lots of green in this one. 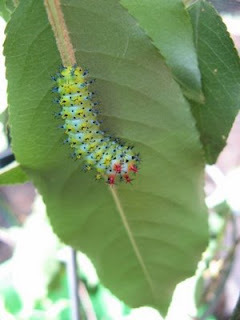 EDIT: Thank you to Shady Gardener, who has identified the beautiful caterpillar shown above as that of the Cecropia Moth. She also provided an excellent website that shows all the stages of growth.